2016 is Gone Hazel’s 20th Anniversary. To celebrate, we are re-releasing early Gone Hazel music along with previously unavailable recordings. 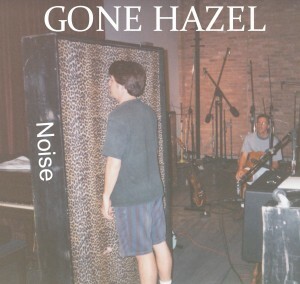 First up is the Gone Hazel compilation, NOISE, which is available on Bandcamp. It contains 5 songs originally released on The Kids Are Bored. When you download the EP you also get a pdf booklet with liner notes and lyrics. It was the summer of ‘96 and loads of guitar-driven bands were high and low. Nirvana was done but Oasis still stood at the top of the mountain. Also adding their sound and fury to the mix were Dodgy, Sloan, Fastball, Blur, Presidents of the USA, Weezer and Green Day (to name a bunch). Gone Hazel began with all this great music swirling around them. In the beginning, Chicagoan Bob Cellini (bass, vocals) hooked up with Torontonians Roberto LiVolsi (guitar, vocals) and Tim Woodger (drums). Early rehearsals were in Tim’s basement, early songs consisted of Roberto and Bob’s back catalogue and early gigs took place as much as possible. The boys were united in three ways: songwriting talent, love of a variety of music and a sense of humour. The humour came out in their first independent release, The Gigging of Gets, which was released for the purpose of getting gigs. Those gigs came quickly as did signing with a booking agency in Chicago.